History reigns supreme at 18 Talbot Lane in Easton. Talbot Lane is a one-way street connecting the Easton Post Office to the Academy Art Museum in an area known as The Hill, the country’s earliest free African American neighborhood. The attractive structure sitting at 18 Talbot Lane is one of Easton’s best-preserved early structures, built in 1790. The property has been attracting archeologists from the University of Maryland, College Park, for the past several summers as they unearth remnants from times past. Today, the Talbot County Woman’s Club meetinghouse needs extensive repairs to its three chimneys and six fireplaces, damaged by water. Photograph courtesy of Larry Hitchens. 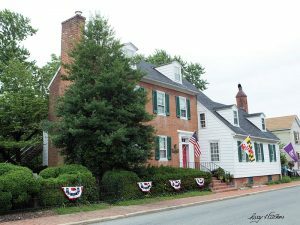 The historic structure is home to the Talbot County Women’s Club, a group that is very passionate about their meetinghouse that the club purchased back in 1946. Much like the ladies in 1946, today’s group is finding that maintaining an historic home is expensive and nearly all consuming. After decades of providing for various organizations such as For All Seasons, Easton Volunteer Fire Department and Chesapeake College, plus many more, the members realized that the structure, at over 200 years old, needs some TLC and charitable works were scaled back in 2017. It’s time for this structure to get the love and attention it deserves. But it will not come cheap. As Shirley Brodhead states, “We don’t want to let the previous ladies down.” It was a stretch for the club to purchase the property in 1946, acquiring an already aged home (actually there were two that were joined in 1946). After much perseverance, the property was acquired. But membership was at a high with 100 or so members. Today there are nearly 40 members. The worry associated with such a task wears heavily on Edythe Humphries’s face. As president of the club, she wonders how they will pay for the renovations. 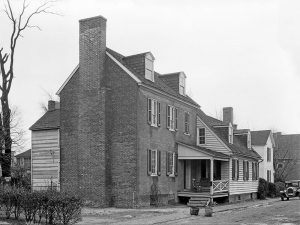 The property at 18 Talbot Lane, as it looked in 1936, is on the National Register of Historic Places. Although there are conflicting dates, the brick house was reportedly built in 1790 by James Price. The one and a half story white frame building was built in 1805 and later joined to the brick home in 1891. Members are currently trying to confirm these dates. Like any large-scale project, though, you chip away at the tasks into manageable portions. The group has been meeting regularly to chronicle its history as well as the property’s lineage. Over history, dates have become jumbled. Ladies have been sorting records, tracking down deeds, reviewing newspaper clippings and trying to put their club’s long history into proper order. They are busy getting estimates from contractors and working with Ward Bucher, a restoration architect, on the property’s immediate needs. Water damage has decimated the fireplaces and lead paint needs removing. With help, a grant application with the Maryland Historic Trust with its historic preservation grant program was submitted. Now the members wait until October when the grants are awarded. Recently, the Women’s Club held an open house that attracted many history buffs. It’s something the group plans to do on a regular basis starting this fall. On the first Saturday of every month, the Women’s Club will be open to the public from 10 a.m. to 2 p.m. for tours. The Talbot County Women’s Club got its start in 1930. Dues are just $40 a year and include educational meeting programs and a social hour every second Tuesday of the month. On September 12, 2017, Talbot County Sherriff Joe Gamble will speak on the opioid epidemic in the county. Lunch begins at 12:30 p.m. and the meeting starts at 1:30 p.m. Other topics include floral arranging, Pilates, acupuncture, 17th century history of the Eastern Shore of Maryland and more. 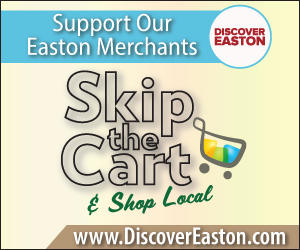 For more information, contact Edythe Humphries at 410-745-2925 or ehphoebe@hotmail.com.